Only one big topic for Asian markets this morning and unfortunately, not a happy one. The uptick in geo-politics dominated everything today and unsurprisingly saw equities retreat, with a rally in gold and treasuries. The Nikkei fell the most of the cores with a decline of 1.3% and saw a strengthening of its currency down to mid 109’s. KOPSI lost 1.1% whilst the Australian ASX gained +0.4%. China core Shanghai closed only small lower -0.2% with the Hang Seng down -0.35%. The rush to safe-havens dominated all talk today but many were questioning the speed of this political escalation. The mood for Thursdays trading will depend upon how the US cash markets close later today. Late in US trading values have recovered a little and we watch as currencies trade back also. Europe has seemed fragile for a while and so did not need further explanation of the news as stocks saw declines of close to 1.5%. The DAX led the way initially then saw the CAC exceed with financials and energy leading the way. The Italian FTSE MIB lost around 1% while the UK’s FTSE lost just -0.6% but did see the GBP take a bit of a hit (later recovered). 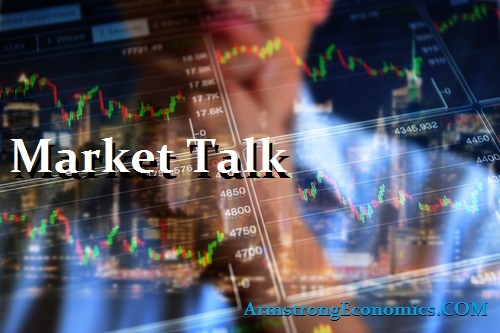 US economic data (PPI) release better than expected which, at best – refreshed a few bids but the geopolitical concerns remained into the European close. Another topic being discussed was former IMF economist Ken Rogoff saying interest rates have replaced China as the biggest threat to the global economy. Nerves continued as the US cash markets opened even with encouraging data – PPI better than expected. However, energy, utilities and yield plays were the sectors holding in as we drifted lower. Interesting that if we had had the exact same news last year the chances are we would have seen triple digit losses. This year with volumes and volatility so low, what would normally have been a trade today actually turns into nothing. Still looks as though this rally remains unloved with many yet to climb aboard. Maybe we need to wait until Friday CPI data for more direction or indeed Jackson Hole later. The core indices saw their worst declines in the morning session as prices rebounded into the close. The Russell fell almost 1% but the DOW and S+P only small lower. S+P Put vol was bid today as you would expect and the VIX jumped 35% but still way under normal levels for this time of the year. 2’s closed 1.33% (-2bp), 10’s at 2.25% (-2bp), 30’s at 2.82%, Bunds 0.44% (-3bp) closing the US/Germany spread at +181bp. France closed 0.71% (-4bp), Italy 2% (+1bp), Greece 5.40% (+3bp), Turkey 10.49% (+10bp), Portugal 2.78% (-2bp), Gilts 1.11% (-4bp).